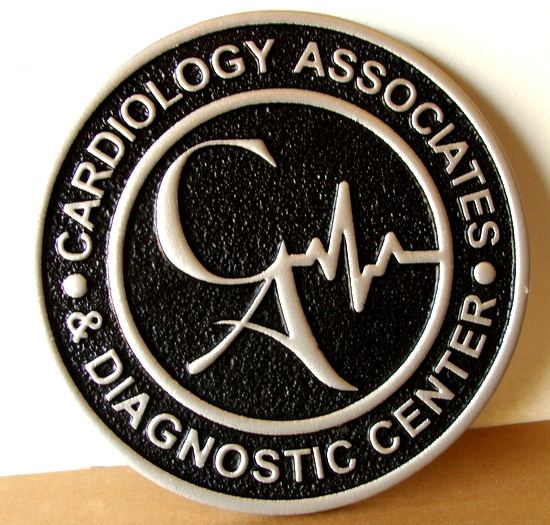 Above is an metallic-silver painted 2.5D flat relief carved sandblasted HDU wall plaque, for a Cardiuology Diagnostic Center. The plaque is carved with raised letters and art from High-Density-Urethane, sandblasted and painted, and then the letters are painted with two coats of metallic silver paint. Prices for these silver and gold painted wall plaques vary widely with size and complexity of design. These custom metallic painted plaques cost the same as our other color painted HDU wood plaques, and are about half the cost of our metal-coated and gold- and silver-leaf gilded plaques & signs. Please call us at 951-698-8484 or email us at info@artsignworks.com for design options, price quotes, and delivery schedule, and our knowledgeable and helpful Customer Service Representatives will respond to your requests promptly. We are proud of every sign we design and fabricate, and we are sure you will be pleased with your carved sign or plaque. To see prices or get Estimate and Order forms , click on gray boxes in upper left margin. Click on dark gray tabs on the header to see Home and other informational pages. Click on one of the light gray numbered boxes in the lower left margin to see other photo galleries. Other medical plaques are shown in Gallery 11.